Our in-house team of expert tool designers and engineers can work with you to ensure you’re getting the best quality and greatest value from your metal stamping and fabrication projects. In our experience, front end design and engineering work greatly improves metal fabrication processes, and our forming simulation goes a long way to shoring up the efficiency of stamping processes. The design and engineering team works closely with our in-house tool and die team on tool design for all kinds of stamping projects, including progressive dies. They also can coordinate with the tool and die team to design and build fixtures that greatly increase the efficiency of fabrication projects. At Waukesha Metal Products, designers and engineers aren’t an afterthought – they are essential to everything we do. 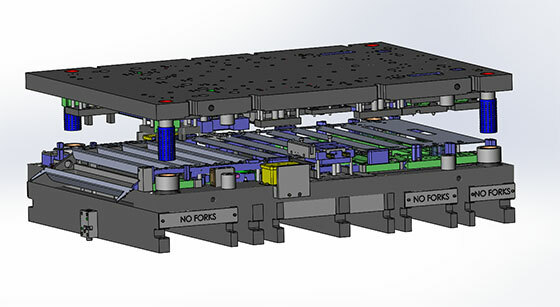 Not only is our design and engineering team highly trained, but they are also equipped with industry-leading design and analysis software, including Logopress, SOLIDWORKS, and Fastform. Through our years of experience in the industry, at Waukesha Metal Products we know that clear and consistent communication is key to producing high quality parts on budget and on time. By opening up lines of communication, your engineering department can better explain the reasoning behind design choices and, if necessary, we can better explain our suggestions for efficiencies. This allows us to shorten your lead time and reduce the risk of producing flawed parts. You’ll get better results at a more effective cost. Our engineers work diligently to ensure quality in every part we produce. In coordination with program managers, production personnel, and our in-house tool room, designs are put through numerous reviews to ensure successful production runs. After production starts, our team keeps an eye on your parts by utilizing our custom sensor technology. We’ve got the in-house know-how to design and place sensors so we can catch issues and confirm efficiencies. Our advanced sensor systems carefully monitor how the coil is feeding through the die, avoiding any potential issues that may lead to damage of the die. This way our engineers can address problems quickly, making sure your production run stays on track. Learn more about our quality assurance programs here. Our engineers put new metal stamping parts through a formability analysis in an attempt to catch potential material failures before any work is actually done. 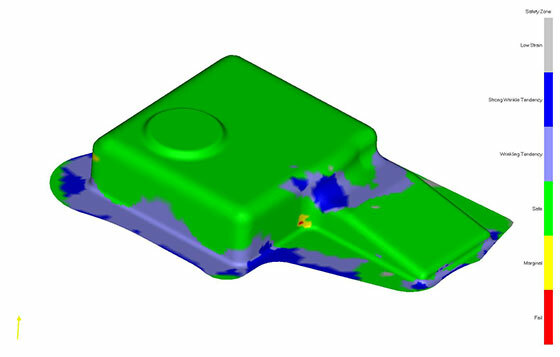 Our formability software is especially useful for streamlining the metal stamping process. Through digital simulations, we can identify areas in a material with a high potential for failure and areas where we might be able to streamline the production process. This can be done during the quote stage so that any potential concerns are addressed before we get to the tool room, saving both time and money. With metal fabrication projects, our design and engineering department’s first focus is on identifying any potential issues with manufacturability. Beyond ferreting out potential problems, we’re also seeking opportunities for efficiency. We want to fully understand the design so that we can identify features that may be unnecessary. That’s one of the key ways that we can help bring your project in at the best possible value.